Out-going DC Kohima, Rovilatuo Mor, delivering his speech during farewell programme in the DC’s conference hall, Kohima, on January 5. Dimapur, Jan. 5: A farewell programme in honour of the out-going Deputy Commissioner, Kohima, Rovilatuo Mor was held in the conference hall of the DC Office, Kohima, on January 5. The out-going DC, Rovilatuo Mor, in his speech, expressed gratitude for the respect and love shown towards him with their physical presence on the occasion. Sharing his experiences, Rovilatuo felt that posting of SP and DC in a district deserve more serious and respect from the government as they shoulder the whole lot of responsibilities. 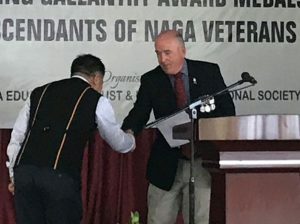 The out-going DC admitted he had a wonderful experience working together with the administrative officers, which according to him was the best working team of Kohima district. He also thanked all the Kohima DPDB members and various Committees for their cooperation and support. 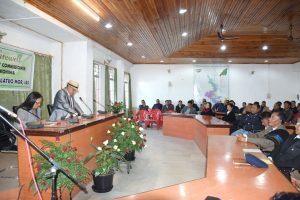 He further thanked the Angami Public Organisation (APO), Kohima Village Council (KVC), Rengma Hoho (RH) and other NGOs for extending full cooperation and contributing mature views and opinions by maintaining the law and order situation for the betterment of the district. The outgoing DC solicited the same cooperation, support and understanding towards the incoming DC, Rajesh Soudararajan. He has further assured assistance to extend any information, clarification or guidance if required in the days to come. The incoming Deputy Commissioner, Rajesh Soudararajan, in his speech, said he was honoured to take over as Deputy Commissioner of the historic, prestigious and the capital city of the State. He also extended his heartfelt thanks to the outgoing DC to be a part of the programme. The incoming DC also thanked all the speakers and APO president for welcoming him and commissioning him as a member of APO and further thanked them for their assurance to cooperate in his tenure. While assuring of his best ability in discharging his assigned duty, he has sought cooperation, valuable suggestions and advice in days to come. Others who also spoke on the occasion included ADC Planning, Ketoho Luho on behalf of DPDB Kohima; Kohima Village Council Chairman, Medoselhou Keretsu; Angami Public Organisation president, Dr. Vilhusa Seleyi; Rengma Hoho representative; SDO (C) Sadar Kohima, Kethosituo Sekhose on behalf of Officers; ADC, Chiephobozou, Linda Solo on behalf of out-post officers and Kamai on behalf of DC Office staff, Kohima. The farewell programme was chaired by Additional Deputy Commissioner, Kohima, Lithrongla Tongpi, who also delivered the welcome address, while PA to DC, Kohima, and other DBs presented a special composed song in honour of the out-going DC. The vote of thanks was delivered by SDO (C) Judicial, Kohima, Neilezo Tep.